Perfect for breakfast or dessert. Preheat oven to 375°. Coat a 13 x 9-inch pan with cooking spray. Place potatoes in a small saucepan and cover with water. Boil for 30 minutes or until cooked through. Drain and place in a medium bowl. Remove 1 cup of sweet potato and set aside. In a small saucepan, add milk and bring to boil. Remove from heat and add ½ cup butter, stir until melted. Mash together with sweet potato. Add egg and mix well. Set aside to cool. In a medium bowl, combine 2 ¼ cups flour, yeast, sugar and salt. Mix well. Using a hand mixer on low speed, beat sweet potato mixture into dry ingredients. Slowly add remaining 1 cup of flour, mixing well. Turn out onto a floured surface and knead for 5 minutes, or until smooth. Pat into a ball and cover with a damp towel. Let rest for 10 minutes. Meanwhile, in a small bowl, combine reserved cup of sweet potato, brown sugar, cinnamon and ¼ cup room temperature butter. Roll out dough into a 12 x 9-inch rectangle. 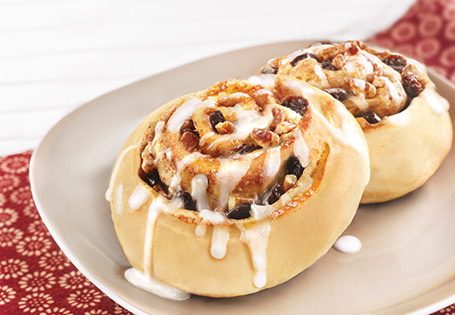 Spread sweet potato mixture on top of dough and sprinkle with raisins and pecans. Starting at one end, roll dough into a cylinder, pinching the seams together. Cut cylinder into 12 equal sized rolls and place cut side up into prepared pan. In a small bowl, whisk together powdered sugar and milk until smooth. Drizzle over warm rolls and serve.